When I was growing up fried rice was a Saturday morning treat. I'd wake up early and immerse myself in the legendary cartoons of the 80s while my mother took the leftover rice from the night before and dumped it into a wok. I could smell the sizzling garlic long before she yelled for my siblings and I to come to breakfast. The meal in question consisted of eggs and jasmine rice perfumed with garlic and seasoned with salt. At first glance, it was white rice with eggs, but one bite and I was sent to heaven for the 5 minutes it took me to finish my plate. Fried rice, like stir fry, is a great way of using leftovers. It's one of those "Everything-But-The Kitchen-Sink" recipes that will work with any non starchy leftovers like meat or veg. The best fried rice I ever ate was made in a pan that had just cooked eggs or stir fry, but that's not a necessary step in the process. Like stir fry, there's an art to making fried rice, and while it IS easy to do, it's not THAT easy! As with my article on stir fry, I'm going to start you off with 5 principles that will guarantee delicious fried rice every time. 1. ALL your ingredients (except your egg, garlic, and green onions) should be ALREADY COOKED. That means your rice and any other meat and/or veg should be cooked BEFORE you turn on the frying pan or wok. Have some leftover stir fry you need to stretch to feed 4? Some fried tofu from yesterday's order of takeout? Some cooked ground beef or chicken leftover from a BBQ or taco night? Chop it up extra small and throw it into your fried rice. Like stir frys, fried rice cooks extremely fast. That means that you need to have everything ready and on hand the second you turn on the heat. 3. Use an Oil that can take the HEAT. This is the same rule I mentioned in my article on stir fry, however, if you're making fried rice for breakfast, you CAN substitute 1/4 of your oil for butter. DO NOT USE JUST BUTTER; its low smoking point guarantees burnt rice. 4. Don't be afraid to let the rice crisp up a bit. 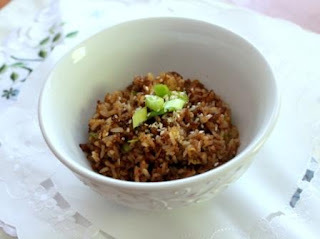 For me the best part of fried rice are those crisped chunks of rice that start at the bottom but can be spread throughout the dish with a few stirs of a spatula or wooden spoon. This phenomenon is called "Socarrat" when it happens with paella (a Spanish rice dish), but in other foods I'm happy to just call them "the crispy bits". The way to get this effect is by pressing your rice down into your pan or wok with a spatula and waiting 1 minute before flipping it over and giving it a stir. The crispy bits add a great textural contrast, but obviously if you don't like crunchy rice, skip this step. 5. Go Easy on Sauces and Seasonings. Since you're probably using leftovers for this, they will have tons of flavor already, and you don't want to overload your food with salt, sugar, or spiciness. Stick to basic flavorings like salt, pepper, and garlic FIRST, and only add a little. Then give your fried rice a taste. If you like it, you're good to go! If not, add a little more, and a hit of hot sauce if you like. REMEMBER: it's easier to add more of an ingredient than it is to take it out. 2 Cups Leftover Cooked Rice - I know whole grains like brown rice are healthier, but I grew up eating fried rice made from cooked white jasmine rice, so that's what I cook with. Use what you like. 1 Egg, beaten - This gives the rice that golden fluffiness. If you're allergic to eggs and/or cholesterol conscious, you can leave it out. The rice will be fine. 2 Large Cloves of Garlic, peeled and smashed or crushed - Smashing or crushing the garlic will usually get the peel off and release its oils in one fell swoop. Once the rice is ready, you can take out the garlic, but if you want to eat, you're better off chopping it small. Salt or Soya Sauce - This is one of the few recipes where they're interchangeable as you'd be using soya sauce as much for its salt content as its flavor and colour. 2/3 Cup of Cooked Meat and/or Vegetables (Optional) - The first five ingredients are all you need to make your basic fried rice. These leftovers turn a side dish into a meal. If these leftovers are saucy, pour out some of the liquid before making your mise-en-place. 1 Spatula - IF YOUR PAN OR WOK IS NON STICK, USE A PLASTIC OR SILICONE SPATULA AS METAL ONES SCRATCH OFF NON-STICK SURFACE WHICH INEVITABLY END UP IN YOUR FOOD. Heat your pan or wok on high heat and dump in your oil. Slowly count to ten and then add your garlic, stir it around in the oil, and then let it sizzle in the pan for a minute. Add your rice and stir everything together with your spatula, breaking up any clumps. Pour in the beaten egg and stir everything together with your spatula until the egg is cooked. As the egg is used as a coating, you might not see it in the pan once you've stirred it in. Don't worry, it's there, and it cooks in seconds. Add your leftover meat and/or vegetables and stir everything to combine. Taste your rice and a little salt or soya sauce and the hot sauce, if using. Press the rice into the pan or wok and leave it for 1 minute to get those crispy bits. Stir the fried rice together to evenly distribute them and serve! Stay tuned for next time when I'll be showing another amazing way to use leftovers: in PIES!